The report yesterday that newspaper circulation declined another 5% in the latest reporting period got me thinking about ice cream for two reasons. First, anyone who loves newspapers would rather ruminate about rum raisin than the relentless, 20-year slide that has brought weekday circulation to less than 40 million copies today from an all-time high of 63.3 million as recently as 1984. Second, it reminded me that the folks following the tweets of my favorite ice cream shop in San Francisco – a quirky place called Humphry Slocombe – now vastly outnumber those who buy the San Francisco Chronicle on any given day of the week. The shop, which produces such exotic flavors as prosciutto ice cream and beet sorbet, has 301,352 followers on Twitter vs. the 223,539 individuals who buy the print edition of the San Francisco Chronicle on an average weekday or the 10,639 people who follow the paper’s website on Twitter. Think about it: A barely two-year-old business with no marketing budget in a modest storefront in a less-than-fashionable part of town now has a larger and arguably more passionate audience than a once-mighty metro daily that traces its history back to 1865. How did it happen and what does it portend for what’s left of the Chronicle and the newspaper business? Apart from the fantastic Fudgesicle sorbet and Guinness gingerbread ice cream on offer at Humphry Slocombe, the unassuming start-up has mastered the art of zero-cost online marketing through such media as Twitter, Facebook and Google Local. As you can see from the Google-sponsored video embedded below, Godby and his partner, Sean Vahey, quickly learned to leverage the social media to build a community around their product. Friends told friends in food-crazed San Francisco about the place and the owners played into the game by rotating the flavors every day to create a sense of novelty, scarcity and excitement. When word gets out on Twitter that duck-fat pecan pies are available, people stop what they are doing and race to the Mission District in the hopes of snagging one before the always-limited supply is exhausted. The effort, by all accounts, is well worth it. It didn’t take long for the Humphry buzz to extend to Yelp, where fans themselves took up the cause of helping to promote the business. On the Fourth of July, the mother of all mainstream media joined in: The New York Times treated the shop to a mouth-watering, six-page spread in its Sunday magazine. Through the skillful use of social media, Humphry Slocombe has built the sort of passion and engagement that would be the envy of any brand. In an age of user-controlled and user-generated media, every successful brand – including newspapers – will have to do the same thing. :: Build buzz by providing compelling, if not to say provocative, coverage – the more unique, the better. :: Build community by incorporating all manner of user-generated content, including ratings, reviews and comments. :: Build value by helping consumers save money and by helping advertisers make money. If newspapers continue tottering along as the staid, imperious and unimaginative institutions that many of them have come to be, then get ready for the third decade in a row of continuously shriveling circulation. For the first time in 3½ years, digital sales at newspapers caught up with the growth of the rest of the online advertising industry, according to newly released data. In a bright note for publishers, figures provided this week by the Internet Advertising Bureau showed that sales in all online categories rose by 13.9% to $6.2 billion in the second quarter. The industry-wide advance precisely matches the 13.9% gain in digital advertising by newspapers in the same period. The newspaper stats, which are compiled by the Newspaper Association of America, previously were detailed here. 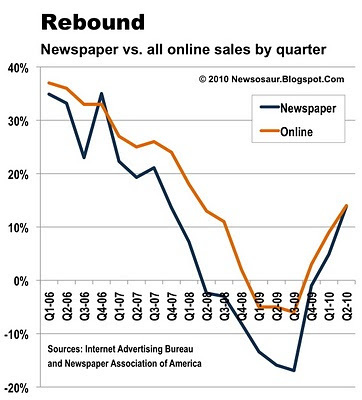 As illustrated in the graph below, the last time publishers kept pace with the online ad industry was in the fourth quarter of 2006, when digital sales at newspapers rose 35% while volume for the industry as a whole rose 33%. In the interim, newspapers have lost market share. With $744 million in online sales for the three months ended on June 30 of this year, newspapers claimed 12.0% of the total online market. Back in the fourth period of 2006, by contrast, publishers had a 15.6% share of the entire digital market. The total online market consists not only of the display and classified advertising typically offered by newspapers but also the search ads sold by such online behemoths as Google and Facebook. The French, as Steve Martin once cracked, have a different word for everything. But a recent ground-breaking study of modern media consumers by BVA, a French market research firm, resonates perfectly in any language. The research is important to anyone worried about the future of the newspaper business, because it demonstrates how profoundly next-generation consumers differ from the aging geezers (this writer included) who account for more than half of newspaper readership in the United States even though they represent barely 30% of the population. The French study found that young people have utterly different attitudes than their elders with respect to such seminal concepts as, say, institutional authority. Further, those attitudes are diametrically opposed to the values, expectations and economic underpinnings that suffuse the newspaper business. The almost complete disconnect between generations means editors and publishers have lots to learn – tout de suite – about modern consumers, if they hope to preserve the long-term sustainability and value of their franchises. But it won’t be easy. Because learning to think, speak and act in this new and alien paradigm is even harder than learning French. In an intensive, three-month study of the media and social habits of 100 consumers between the ages of 18 and 24, BVA found that this generation, which it dubbed “Digital Natives,” doesn’t trust authority, doesn’t want anyone telling them what to think and doesn’t like to pay full retail prices. The study first was reported by my friend Frédéric Filloux, a media strategist and consultant in Paris who graciously allowed me to quote from the English abstract he posted at his blog, MondayNote.Com. Finding: Digital Natives don’t trust politicians, social institutions, the media or corporations. Rather, they rely largely on themselves and their peers to decide what to think, what to do and what to buy. Implications: This pretty much rejects everything newspapers stand for, inasmuch as editors and publishers traditionally have operated on the theory that readers regard them as authorities who report authoritatively on the activities of other authorities – and that advertisers pay big bucks to leverage the authority of the newspaper for their brands. Finding: A generation raised on television screens, computer screens, game screens and phone screens – often all at the same time – can’t get enough information fast enough, leading to frenzied multitasking and attenuated attention spans. The busier Digital Natives get, the less they concentrate, the less they think and the less they absorb. Implications: Newspapers are the antithesis of the empty info-calories often preferred by Digital Natives. Finding: Digital Natives view life as a game of outsmarting authority to beat a system they disdain. Whether catching up on the news or shopping for a car, Digital Natives enjoy the challenge of acquiring and manipulating information as much as the outcome to which it leads. Implication: Newspapers are accustomed to delivering news and advertising in a tidy, trusted, take-it-or-leave-it package that requires scant additional effort. This suggests the most satisfying way a Digital Native can interact with a newspaper is to argue with it. While that might be fun for the Digital Native, it plays hell with the credibility of the press. Implication: Taken to its logical conclusion, this finding suggests the obsolescence of advertising as we know it. The sobering findings of this study represent both a dilemma and a challenge to newspapers. If newspapers tried to change themselves sufficiently to appeal to the Digital Natives, they would be forced to seriously compromise, if not abandon, their core strengths and values. The resulting products in all likelihood would turn off a large number of their most faithful readers. If newspaper publishers don’t develop products and services to appeal to young consumers, however, they run the risk of wasting away as anachronisms that eventually become so irrelevant and unprofitable that they are forced to close their doors. At a time the newspaper industry ought to be desperately seeking fresh insights into the markets they serve and the consumers they hope to serve, it is troubling to have to look overseas for the kind of research that should be under way here. Publishers need to invest in learning everything they can about the Digital Natives on this side of the Atlantic so they can start developing successful solutions to see to the health of their franchises. N'est-ce pas? Although Jan Schaffer just produced a masterful analysis of how to run a grassroots news site, she came up dry on the crucial question of how to turn those journalistic labors of love into sustainable businesses. The best she could do was tell the truth: “Community news sites are not a business yet,” says the forthright Schaffer. She ought to know. As the director of the J-Lab at American University in Washington, DC, she put $833,000 into 46 start-up news sites between 2005 and 2009 in an ambitious project called New Voices. Although the start-ups have produced lots of quality journalism and many valuable lessons for community building and audience development, Shaffer candidly states in the report published last week that no one has figured out how to turn these ventures into successful businesses. The survival rate among the New Voices sites mirrors the longevity of the typical start-up in the United States, according to a 2005 report by the Small Business Administration. Noting that the failure rate for new companies is similar in nearly every sort of endeavor, the SBA found that approximately a third fail within two years of launch and that half of them are gone four years later. The study was completed prior to the global economic meltdown, so results today may vary. While deep commitment may extend the life spans of many journalistic start-ups beyond the norm identified by the SBA, economic realities like food, shelter, kids and car payments eventually could take their toll on even the most dedicated entrepreneurs. Then, where will we be? As previously discussed here, it takes far more than good intentions and great journalism to build a sustainable business. And, as discussed here, there never will be enough money from non-profits to fund all the entrepreneurs hoping for support for their journalistic aspirations. While it is unfortunate that Schaffer did not find the magic bullet for saving journalism, the greatest value of her candid report could well be that it underscores the urgency of doing so. Unable to arrest a decline that has consumed nearly a third of print circulation in the last decade, newspapers are doing the next best thing: Revising the way they count readers to make themselves look better to advertisers. In the second major overhaul of circulation rules in two years, publishers as of Oct. 1 will be able for the first time to include certain types of free products in their top-line circulation totals. This change follows a rule implemented last year that permits newspapers to count print or digital products sold for as little as a penny as “paid” circulation. Before publishers started retooling the nose-counting rules in 2009, newspapers used to have to collect at least 25% of the price of a product to count it as paid. 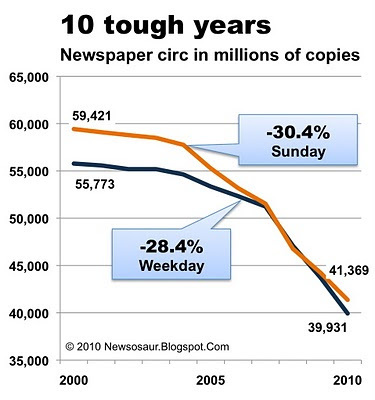 While there are good and valid reasons for many of the changes in the complex circulation rules adopted by publishers in the last couple of years, a not-so-unintended consequence of these changes is that they will make it all but impossible to compare newspaper circulation in March, 2011, with circulation in March, 2010. Given the dramatic drop in newspaper readership in the last decade, you can’t blame publishers for wanting a do-over. 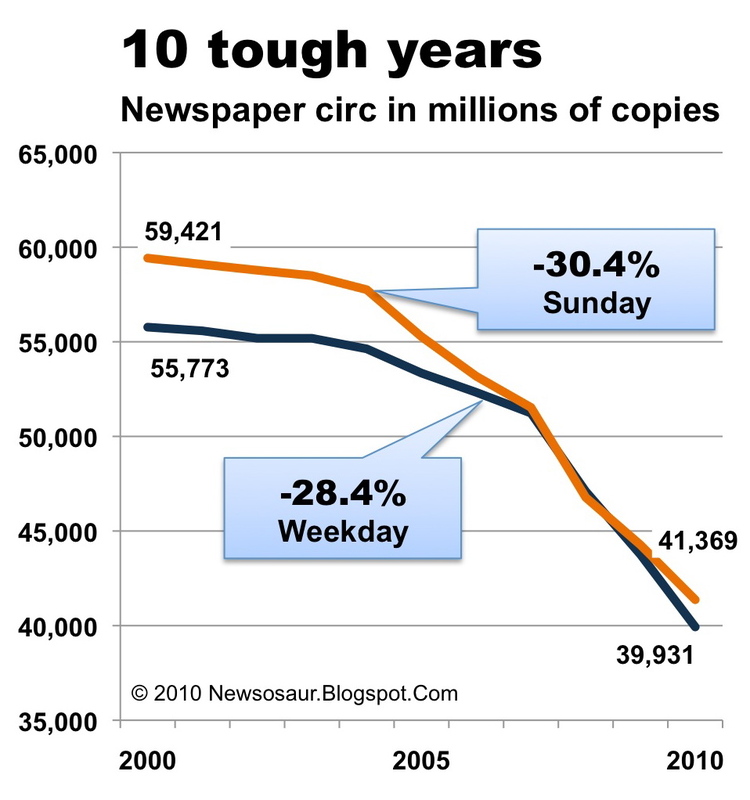 As illustrated below, weekday newspaper sales since 2000 have fallen 28.4% to an average of a bit less than 40 million copies per day. At the same time, Sunday sales slid 30.4% to an average of 41.4 million per week. This means that only about a third of the households in United States today take newspapers, as compared with a penetration in excess of 100% in the years immediately following World War II when some people bought more than one newspaper a day.Nowadays, of course, news junkies consult their smart phones, instead. As reported last month by the Pew Center for People & the Press, only 31% of Americans get their news from newspapers, as compared with 44% who check headlines on mobile media and 34% who use the Internet to keep current on current events. The new rules that went into effect on Friday are part of a two-year effort on the part of the industry to account for the digital and niche print products that represent a growing proportion of their readership. Whereas newspapers a few of years ago counted only paid print copies in the reports they provided to media buyers, publications today want – and deserve – credit for selling digital facsimiles of the print edition, paid access to some or all of their websites and premium-priced mobile apps. Newspapers also need to count print editions targeted to such distinct groups as youthful readers, commuters or Spanish-language speakers. Most publishers also distribute free packages of advertising inserts to the homes of non-subscribers. Because all these channels legitimately enhance the reach of the flagship print product, it is only fair that publishers take credit for them. The new reporting standards also will aid advertisers by giving them a comprehensive and detailed picture of the growing portfolio of products being brought to market by most publishers. The complex task of revising the rules fell to the Audit Bureau of Circulations, an industry-funded group that sets standards for counting circulation and then monitors compliance among participating publishers. While the ABC supports itself by the fees it charges publishers to audit their numbers, two-thirds of its governing board consists of media buyers. Although the ABC rule overhaul is far from complete, the changes that took effect last week mean that many circulation directors woke up on Friday morning with distinctly different numbers than they had when they went to bed on Thursday night. In some cases, the new rules will improve their numbers. In other cases, they will not. Either way, it will make comparisons difficult between this year and last. :: In one case, called “requested” verified circ, the recipient has to agree to take a product, which then is included in a consolidated, top-line figure called the newspaper’s “executive summary.” Although verified circulation long has been a major component in the rate bases of many consumer and trade magazines, it is a new wrinkle for newspapers. :: In the second case, called “targeted” circ, newspapers will be able to count in the “executive summary” all copies of unsolicited papers delivered to an address as long as the homeowner does not object to receiving the copies. The ABC requires publishers to tell the recipient she has a right to stop delivery, but lets the paper count the copy as verified circ if it is delivered continuously to an address for no less than 12 weeks. Publishers giving away free papers have to pay the costs of printing and distributing them, as well as taking an accounting charge for the circulation revenue they forfeited. Because heavy use of free distribution can have a material impact on the bottom line, it is not likely that most publishers will suddenly become profligate in handing out free copies. Other rules allow publishers to count the same subscriber multiple times if she signs up for multiple products. It works like this: If an individual agrees to take home delivery of the print product and agrees to buy the online e-edition of the newspaper and purchases a mobile app, the publisher gets to count each product as a separate subscription. Remember, payments of a penny a year count as fully paid. Publishers also will be able to include certain types of qualifying niche print publications in their top-line circulation numbers. So long as the logo of the flagship paper appears someplace in a copy of the Red Eye or Hoy editions of the Chicago Tribune, for example, the numbers will count toward the over-all circulation of the parent paper. Some of the potential negatives for publishers include elimination of the “other paid” category and a reclassification of the way they account for the papers they give to educational institutions. One thing is sure: The new rules and categories will make ABC reports (see a sample of the new format here) more complicated than ever. On the other hand, proponents of the new system argue that the detailed reporting system will make circulation numbers more transparent to advertisers than ever before. If publishers create the right products and do a sophisticated job of selling advertisers on their ability to efficiently deliver desirable audiences, then the new reporting system could prove to be an asset. At the same time, however, the dismaying trend illustrated below suggests that publishers need to invest aggressively in creating new products to offset the declining circulation of their flagship newspapers. The departure of Hilary Schneider at Yahoo could be a major blow to the Newspaper Consortium she founded, as well as many of the 800 newspapers that count on the partnership to boost their online revenues. The four-year old Newspaper Consortium was formed to help publishers in two ways: By giving them the opportunity to sell unsold inventory on the vast number of websites operated by Yahoo and by using data supplied by Yahoo to increase the rates that publishers charge for targeted advertising on their sites. But the future of the consortium, which has had several ups and downs in its short life, could be endangered by the upcoming departure of Hilary Schneider, a former senior vice president at Knight Ridder who rose to the position of executive vice president for the Americas at Yahoo. As originally reported here by Kara Swisher at All Things D, Schneider is departing the troubled mega-portal along with two other senior managers. The company confirmed here that Schneider will be gone after a “transition period” expected to conclude by the end of the year. With widespread changes in the upper echelons at Yahoo likely to lead to a review of corporate priorities, it is safe to presume that the Newspaper Consortium will come under close scrutiny. This would seem to be particularly the case, given that Yahoo boss Carol Bartz in the past has voiced tepid support for the newspaper project – which was launched prior to her arrival as chief executive in January, 2009 – and that Schneider, the program’s champion, won’t be there to defend it. Schneider, who rose rapidly at Yahoo after losing her post at Knight Ridder when the publishing chain was sold in 2006, put together the consortium with several former colleagues from the newspaper industry. The seemingly symbiotic partnership gave newspapers access to sophisticated ad-targeting technology created by Yahoo, while giving Yahoo access to thousands of local ad reps in hundreds of markets across the country. With 800 participating publications today, the consortium has some 30,000 newspaper reps available to represent it. Newspapers joined the consortium because they felt they did not have the native capability or resources to fund technology development. Yahoo supplied its technology in return for a 50-50 share of future ad sales, recognizing the superior efficiency of selling ads to small and medium businesses through a sales force hired, trained, managed, supported and paid by publishers instead of Yahoo. The problem with this arrangement is that the complex Yahoo ad-serving platform, called APT, took longer to build, cost more money and worked less well than had been anticipated. Further, many of the participating papers proved to be less than adept at selling the expanded inventory available to them. When Bartz arrived at Yahoo in early 2009, newspaper industry sources said Yahoo actually was losing money on the deal. Some publishers seeking recently to join the consortium report that they were rebuffed by Yahoo. As if Schneider’s departure were not bad enough, some of the key newspaper executives who founded the consortium also have moved on. They include Eric Grilly, a former MediaNews Group executive who now works at Comcast, and Rusty Coates, the former digital chief at E.W. Scripps who has left the newspaper business.